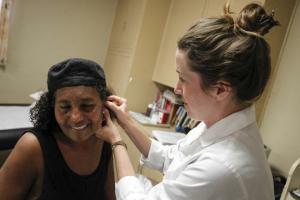 PCOM-SD’s acupuncture clinics for the homeless were recently featured in an article by the San Diego Union-Tribune. Check out an excerpt below or read the full article! Free clinics commonly offer homeless and low-income people medical and dental services, but some San Diego clinics also offer acupuncture administered from students studying the alternative therapy. “Acupuncture may not come immediately to mind when thinking of essential services for homeless people, but David Knoles was glad the treatment was there when he needed it. Read the full article on San Diego Union-Tribune here!